Opis: Undaunted by world wide anticipation of the August 11 total solar eclipse, the moon also performed a lunar eclipse just two weeks earlier, on July 28. Crossing the edge of Earth's shadow the moon was only partially eclipsed - but the spectacle could be seen by observers located across the Earth's night side. 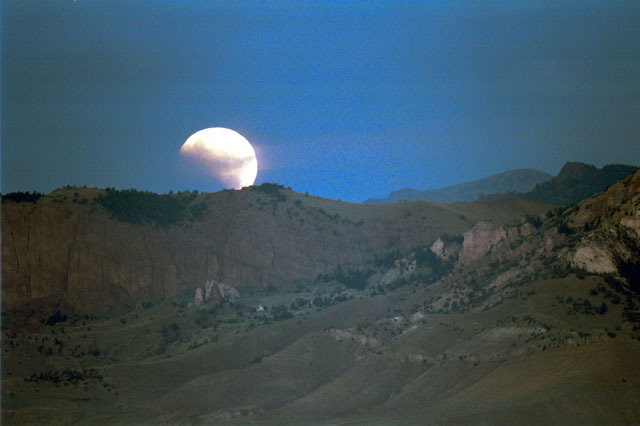 For example, this photo was taken in early morning hours shortly after the mid-point of the eclipse as seen from Cody, Wyoming, USA. Still illuminating the landscape and obscured by a wisp of cloud, the moon is setting behind Sheep Mountain, west of Cody. Enjoying the celestial display, astrophotographer Mack Frost reported fairly clear skies tinged with a little smoke from area grass fires.